Can I set up my own chatroom? Registration is not required to view current topics on the chatroom; however, if you wish to post a new topic or reply to an existing topic registration is required. Registration is free and only takes a few minutes. Join now! The information you provide during registration is not outsourced or used for any advertising by the Heritage Jersey Organization. You may easily change any information stored in your profile by using the "My Profile" link located near the top of each page. Simply identify yourself by typing your username and password, if necessary, and all of your profile information will be available to update. You may edit any information except your username. We cannot tell you what your password is, because of the encryption used to store your password. When signing up for Heritage Jersey, you will be asked to provide a password reset question and answer. Please make sure to write down your username, the email address, and the password q&a as provided upon signing up. If you click on "Log In" in the upper navigation bar, there is always a "Forgot your password?" link beneath the "Log In" button. This link takes you to a page where you will be asked to provide your username and the answer to the password reset q&a that you set up originally. When you answer successfully, an email will then be sent to you with a new, automatically generated password for your account. Please be sure that your email will accept messages from no-reply@heritagejersey.org, and that you check any spam filters and check with your internet service provider if you do not receive the email. All cookies set by the chatroom are expired upon logging out of the Heritage Jersey website. Also, all browsers provide ways to delete cookies for a selected site, if you wish. You can easily add hyperlinks to any message. Simply type the URL (http://heritagejersey.org/chatroom/), and it will automatically be converted to a URL (http://heritagejersey.org/chatroom/faq.asp)! [url]http://heritagejersey.org/chatroom/[/url] takes you to the chatroom! http://heritagejersey.org/chatroom/ takes you to the chatroom! If you use this tag: [url="linkto"]description[/url] you can make a link out of any text. Strikethrough: Enclose your text with [s] and [/s]. Example: [s]This is a mistake. [/s] = This is a mistake. If you copy the image link from other image hosting services, use the “Forum” or “BBCode” options. Those use the standard BBCode that you'll need. However, Snitz can't read the standard code for the [url] tag. So, if you want to use other imaging hosting websites, make sure your code looks just like either example given above. The text between the opening image tag [img] and the closing image tag [/img] should be filled in with your image's specific location and filename; and if you're linking your image to somewhere else, the link within the [url] tag, after the =, should have quotation marks around it. If you want Snitz to actually display everything correctly, you may have to add them manually. If you don't, the URL will show up and make your post look all weird, even though your image will still show up. If there are issues with your images showing up on the chatroom, first edit your post to check to make sure the [img] code is correct. Then make sure your photos are still available on the web. There may be temporary connection issues. If everything looks hunky-dory, please let us know and we'll see what we can see. You may attach signatures to the end of your posts when you post either a New Topic or Reply. 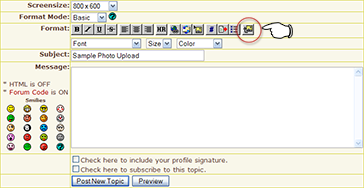 You may edit your signature by clicking on "My Profile" near the top of any chatroom page. You may edit or delete your own posts at any time. Just go to the topic where the post to be edited or deleted is located and you will see an edit or delete icon ( ) on the line that begins "posted on..." Click on this icon to edit or delete the post. No one else can edit your post, except for chatroom moderators or the chatroom administrator. A note is generated at the bottom of each edited post displaying when and by whom the post was edited. Yes. We use Google search to help you find the specific post you're looking for. Simply click on the "search" link at the top of most pages. "Active Topics" are tracked according to the time of your last visit as stored in the cookies for this chatroom. When you click on the "Active Topics" link, a page is generated listing all topics that have been posted since your last visit to the chatroom (or particular other time intervals of your choosing). If you can subscribe to the entire chatroom, you'll get a notification for any posts made within all the forums on our chatroom. You are currently unable to subscribe to the entire chatroom. You can subscribe to an entire category—such as "Marketplace"—to be notified of any new posts made within any topic, within any forum, within that category. If you don't want to subscribe to an entire category, you can subscribe to individual forums. This will notify you of all new posts made within any topic within that one forum. More conveniently, you can subscribe to just an individual topic. You will be notified of any reply made to that topic. Each level of subscription is optional. The administrator can turn on/off each level of subscription per category/forum/topic. To subscribe or unsubscribe from any level of subscription, you can use the "My Subscriptions" link, located near the top of each page to manage your subscriptions. Or you can click on the subscribe/unsubscribe icons ( ) for each category/forum/topic you want to subscribe/unsubscribe to/from. Moderators control individual forums within the chatroom. They may edit, delete, or prune any posts in their assigned forums. The chatroom does censor certain words that may be posted; however, this censoring is not an exact science, and is being done based on the words that are being screened, so certain words may be censored out of context. By default, words that are censored are replaced with asterisks. NOTE: The software is highly configurable, and the baseline Snitz Forum may not have all the features of this chatroom.